The main building Davis Hall was built in 1852. It was designed by the same Worcester architect who designed St. Paul's cathedral some 20 years later, Elbridge Boyden. From 1852-1854, Worcester Academy was Worcester Medical College. From 1856-1860, it was the Ladies Collegiate Institute. In 1864, it became the Dale General Hospital for wounded Civil War veterans. Finally in 1870, it became Worcester Academy only to be torn down in 1964 at age 112. The following are links about The Worcester Academy you may find interesting. Also check out the other pages. The following are comments left about The Worcester Academy from site visitors such as yourself. They are not spell checked or reviewed for accuracy. Worcester Acadamy was founded in 1834 on a farm on the summit of land between Oread and Benefit St. Benefit St got it's name from the fact that land was sold to help support the school when it's funds were low. The 3 brick buildings and land were sold in 1860 and the school relocated for a short while to the old Antiquarian Society Building on Summer St. When the Academy moved to Providence St. the oldest building with it's towers was the Dale Hospital during the Civil War. A number of regulation barracks were erected at the rear of the building and the hospital was run for 14 months at a cost of $75,000. The hospital could care for 1000 soldiers but never reached more than 600. Only 16 deaths occured there in the 14 months of operation. 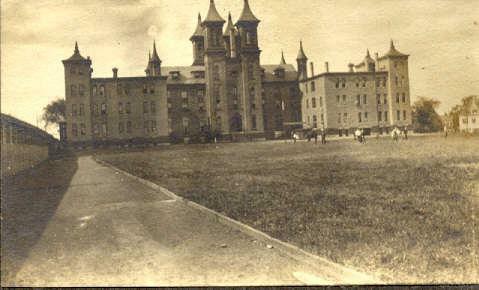 In 1865 the barracks were sold at auction and the hospital was discontinued. The towers in Davis served as closets for the dorm rooms. Windows in the towers were at floor level and provided venting between floors. Disastrous if you smoked in your room and the prof was directly below! I am currently writing a college honors thesis on Oread Collegiate Institute. It is my understanding that it may be one in the same as the school you refer to as the 1856-1860 Women's Collegiate Institute. This would have been the first females college in the United States. It was located at Worcester and was referred to as Oread Collegiate Academy. This is my first time visiting this sight. I must say I love it. I have lived in Worcester off Dorchester St. my whole life and I'm very impressed with the pictures I see. I plan on returning to this sight several times. The pictures bring back wonderful memories of how things use to be. Thank You. Worc. Academy was where Abby Hoffman went to school (not sure of years), and stories are told of his bowling in the dorm hallways and helping himself to clean shirts in the laundry rooms! I was given an old engraving of the Female Collegiate College of Worcester,and the accompanying information lists it as the first college for women. I have been trying to find out more about it and I was so happy to learn more from the information at this website. The building was beautiful and I wondered if it still existed. You're kidding - it originated on Oread/Benefit Street? I lived on Oread Street from probably 1947-1958, My great aunt lived in a huge boarding house on Oread - she had one apartment that consisted of probably 8 or 9 rooms. She lived in 3 and rented out the others. I recall that the boarders had a separate kitchen and they're rooms were off a hall. The building was owned by Mrs. Myott then, I think - it had an elevator and big wide stairs, I wonder if it was part of the college. As a kid in the 70's I used to attend Worcester Academy Sports Camp in the summertime. It was a great day camp for boys - we played all types of sports. I remember playing basketball in the old gymnasium and running on the track up above the court. The banked turns were so much fun to run on. We used to wear white jerseys with maroon shorts. At the end of each camp session we had 'Olympics' and I still have some of the old trophys somewhere in my belongings. As a teenager in the early 80's I became a camp counselor and recall many fond memories of working with the kids on hot summer days up on the hill in Worcester. I lived across from the Worcester Academy in my early years. The hurricane of 1938 was responsible for the towers collapsing which changed the whole appearance of the academy. One of my friends was Mary Radar who was the daughter of Professor Radar who taught at the academy. One of my favorite memories is the beautiful red maple tree that stood in front of the main buildiing. It was estimated to be about 3-400 years old and was just glorius. It was my favorite spot. I used to climb the tree and was able to see what was going on in my neighborhood. The tree was taken down to accommodate new dorms, but I shall always carry a picture of it in my heart. Jay Guillette was my man and he graduated from Worcester Academy. Is it any wonder I fell in love with him? A great school which continues to meet the needs for quality education. It's a Worcester treasure!